This Hand Soap Sampler contains three slices of our Shea and Cocoa Butter Hand Repair soap, one each of Mountain Herb, Green Tea and Lavender. Each soap is individually wrapped separately from the others and labeled so that you, or whomever will be receiving your gift, will know exactly 'which soap is which' as you try each bar. The bars are then wrapped together in a colorful strip of fabric and enclosed again with a decorative cellophane bag and gold foil label. Minimum weight is 4.5 ounces or one and a half full size bars. 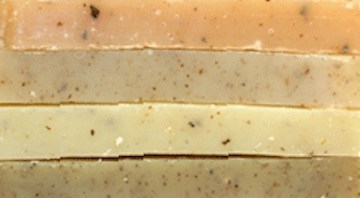 Soaps in this Sampler include Olive, Coconut, Castor and sustainably harvested Palm Oils, Shea Butter, Cocoa Butter, Sodium Hydroxide (Lye), Mountain Spring Water, ground medicinal herbs, fragrances and essential oils.